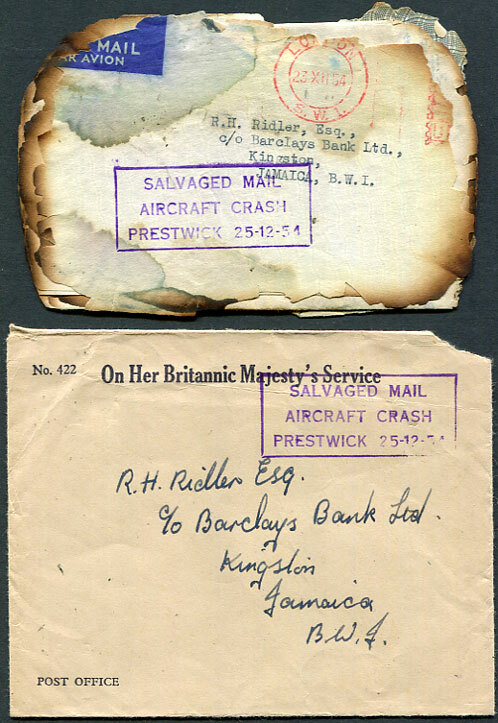 1954 charred edge back and front of cover pmk'd London 23 XII 54 together with contents to R.H. Ridler, Barclays Bank Ltd, Kingston, Jamaica, B.W.I. 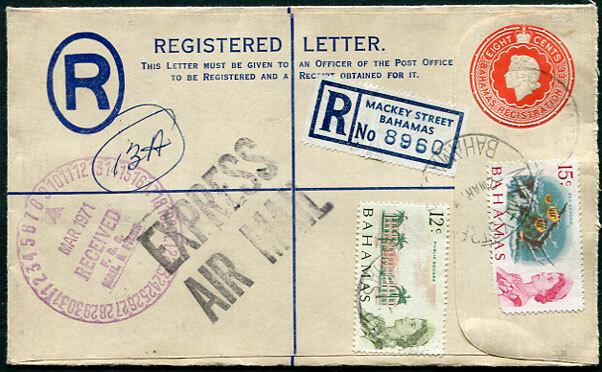 requiring completion of its journey, due such distressed condition, by Great Britain Post Office O.H.M.S. ambulance cover, both covers struck with purple boxed "SALVAGED MAIL/AIRCRAFT CRASH/PRESTWICK 25-12-54"., flap of latter poorly opened. BOAC Boeing 377 Stratocruiser crashed on landing at Prestwick Airport in the early hours of Christmas Day 1954, 28 of the 36 onboard were killed. 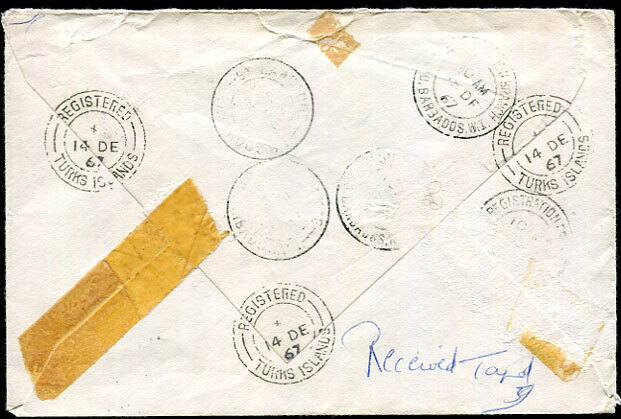 1971 use of QE2 8c orange-red PSRE to Washington DC, USA with added QE2 12c, 15c pmk'd Mackey Street 2 MAR 71 with large black EXPRESS/AIR MAIL handstamp alongside, transit and arrival backstamps. 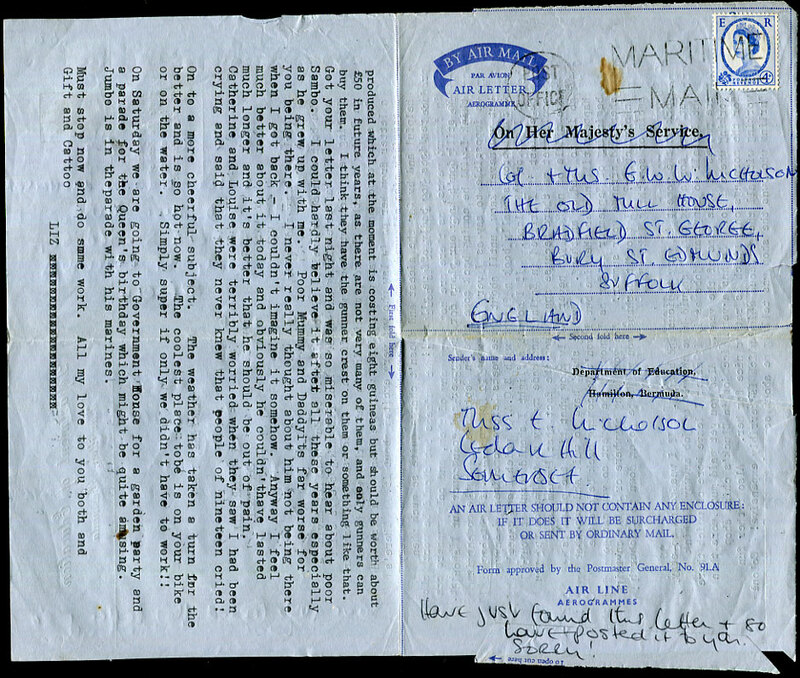 1966 (JU 9) lengthy typewritten letter from a 19 year old Colonel's daughter to Bury St. Edmunds, Suffolk on an overprinted for Government use Air Letter (overprinting deleted as used personally) mailed with GB QE2 4d pmk'd Post Office Maritime Mail. 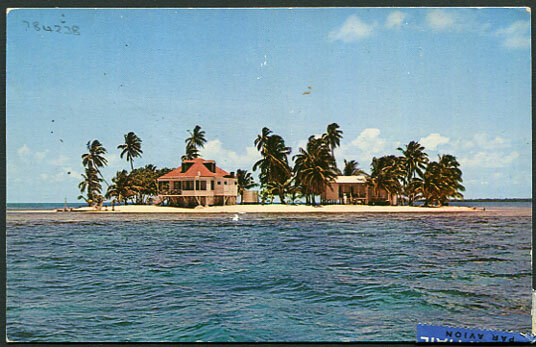 Coloured ppc of Sergeant's Cay with red cachet "1 R HAMPS" and 3-line "FORCES MAIL/BRITISH TROOPS/BELIZE" written with sender address of Up Park Camp, Kingston, Jamaica to Swindon, Wiltshire with QE2 10c pmk'd Belize 15 OC 60. Writer's message includes "overleaf is where Princess Margaret stayed". 1967 reg. 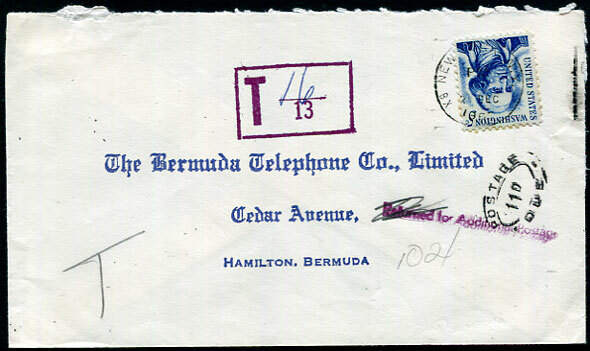 cover to Christ Church, Barbados with QE2 1/- Marlin fishing tied GRAND TURK */14 DE 57 d/ring, two purple str. 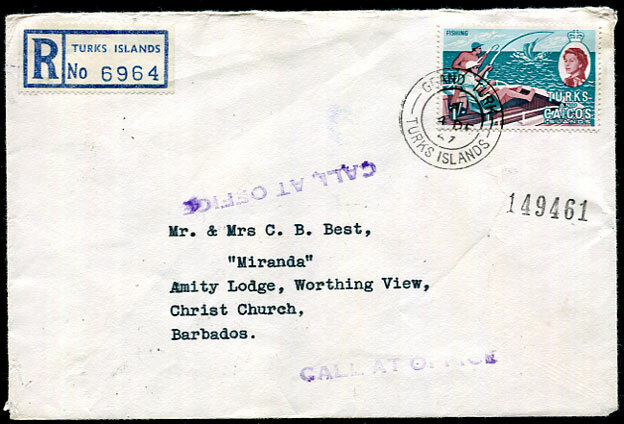 line "CALL AT OFFICE" applied alongside address panel with reverse appended "Received Taped" showing both Turks and Barbados registered datestamps. 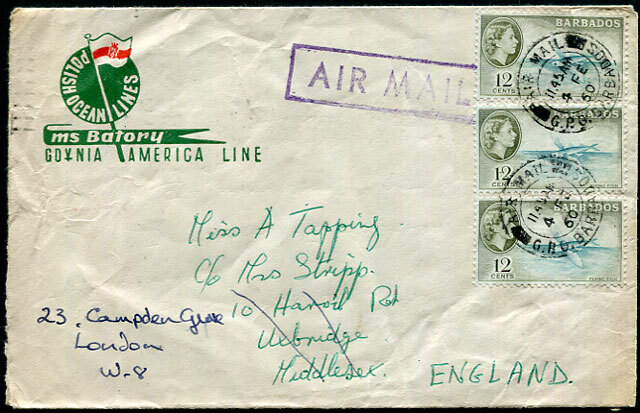 1960 Polish Ocean Lines ms Stefan Batory printed cover with QE2 12c strip of three pmk'd GPO Barbados 4 FE 60 to Uxbridge, Middlesex re-directed London, reverse with delightful machine slogan. 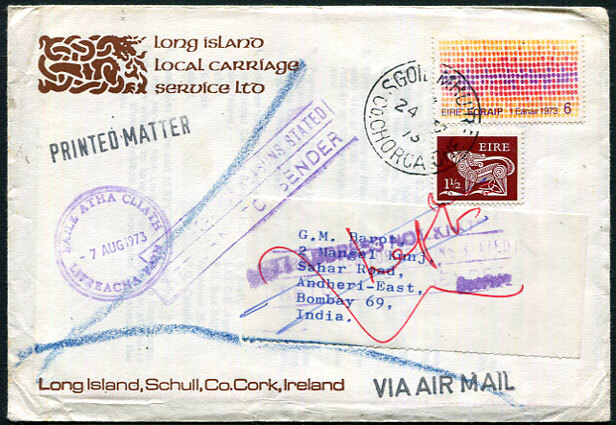 1973 cover with Eire 7½p airmail printed matter rate pmk'd Sgoile Mhure (Schull) 24 IV 73 on face and Long Island 4p Harbour issue tied to reverse addressed Bombay, India, returned with various handstamps showing Baile Atha Cliath (Dublin) 7 AUG 1973 return. 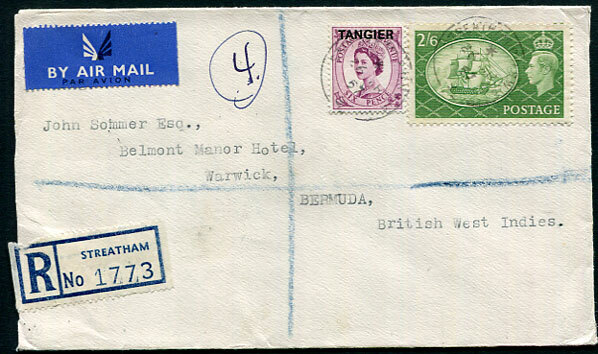 Very few of these returned covers which travelled thousands of postal miles are known. Permission for Long Island locals was given by the Department of Posts, Dublin. 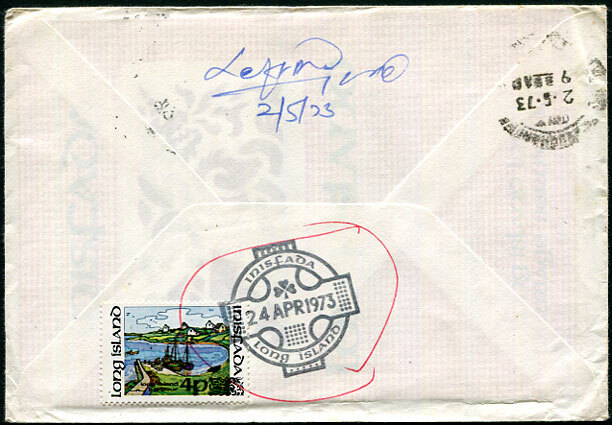 After a year of preparation, much delayed by difficulty in finding a perforating machine, the stamps were issued AP 24 1973. 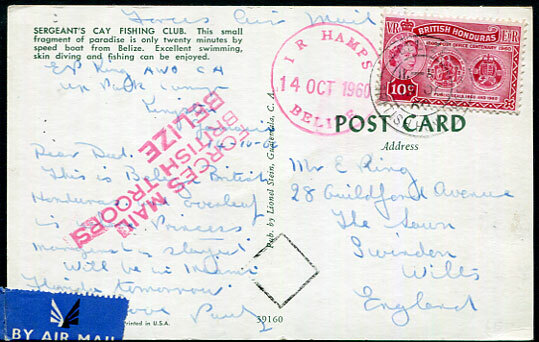 First Day Covers were prepared and serviced in Schull (and collected later in the day) and over 1,000 others letters were posted that day to collectors and stamp trade worldwide. Instead of travelling the 60 miles direct to Cork Airport these letters reached nearby Skibbereen where postal rules dictated that all mail should be cleared before employees go home. 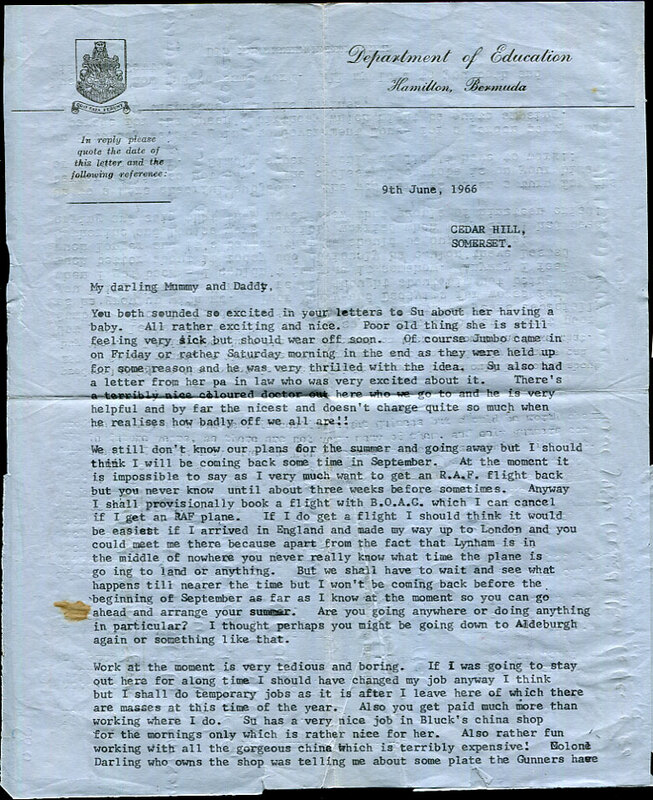 Instead of the expected 15 or so letters over 1,000 arrived and on noticing the Long Island locals on reverse Dublin was phoned who said not to accept more mail until the matter was looked into. Orders were serviced in the following weeks, but due Government reshuffles no authorisation to continue ever came and the service, although legally approved, was eventually abandoned. 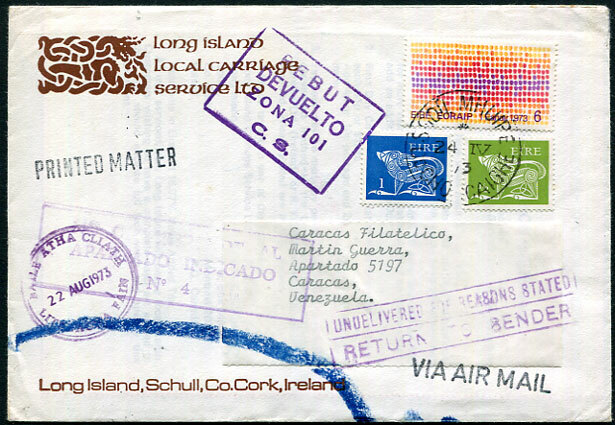 1973 cover with Eire 7½p airmail printed matter rate pmk'd Sgoile Mhure (Schull) 24 IV 73 on face and Long Island 4p Harbour issue tied to reverse addressed Caracas, Venezuela, returned with various handstamps showing Baile Atha Cliath (Dublin) 22 AUG 1973 return. 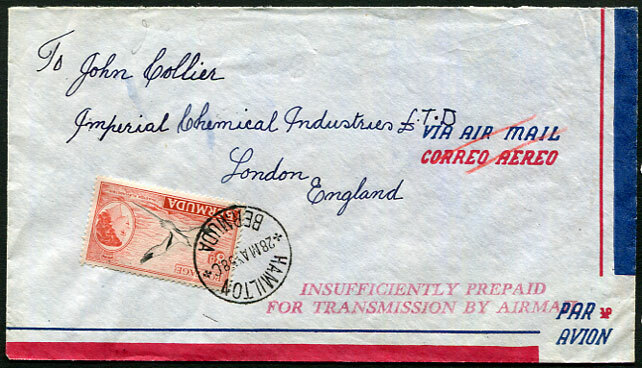 Very few of these returned covers which travelled thousands of postal miles are known. 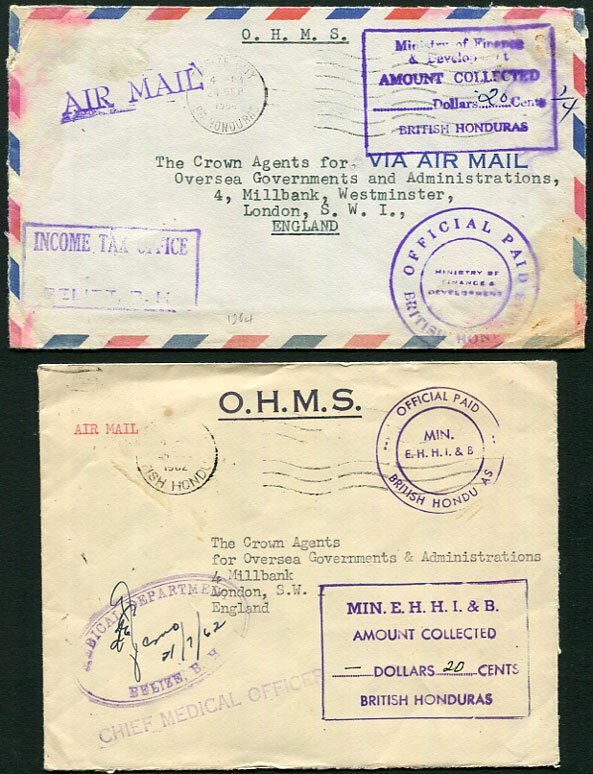 1962 Chief Medical Officer and 1964 Income Tax Office OHMS OFFICIAL PAID stampless covers, first opened three sides, second with water stains. OFFICIAL PAID/GOVT. 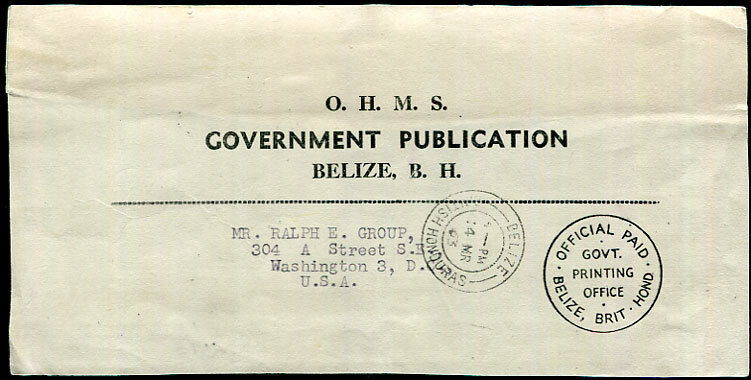 PRINTING OFFICE/BELIZE wrapper front to Washington D.C., USA pmk'd Belize 14 MR 63. 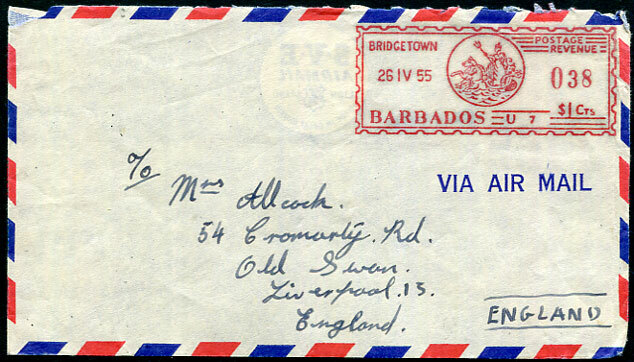 1955 cover marked on reverse "C. Allcock, Senator, Barbados" alongside violet oval d/ring COSTA & Co. LIMITED/General and Commission Merchants/BARBADOS to Liverpool with superb Seahorse 0.38c meter cancellation dated 26 IV 55. 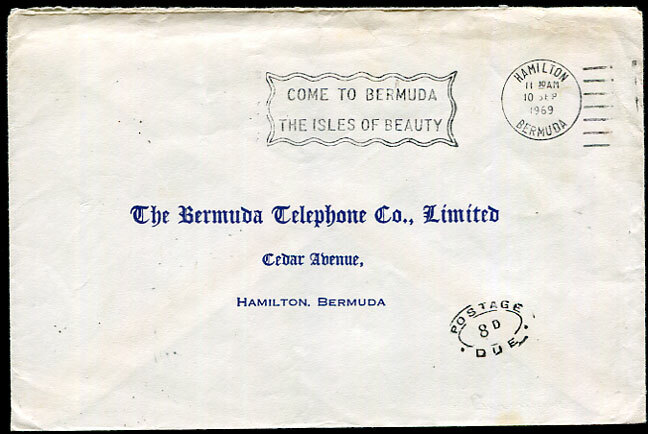 1958 cover with QE2 8d tied Hamilton 28 MAY 58 cds to London, England, red 2-line "INSUFFICIENTLY PREPAID/FOR TRANSMISSION BY AIRMAIL". 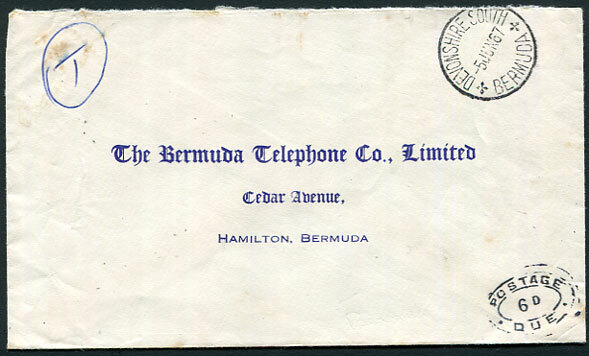 1967 (JU 5) stampless unpaid local cover from Devonshire South to Hamilton, "T" mark with POSTAGE/6d/DUE handstamp, some toning. 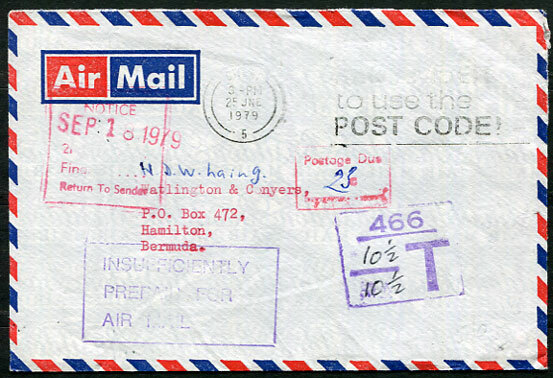 1969 (SP 10) stampless unpaid internal town cover pmk'd within Hamilton POSTAGE/8d/DUE handstamp. 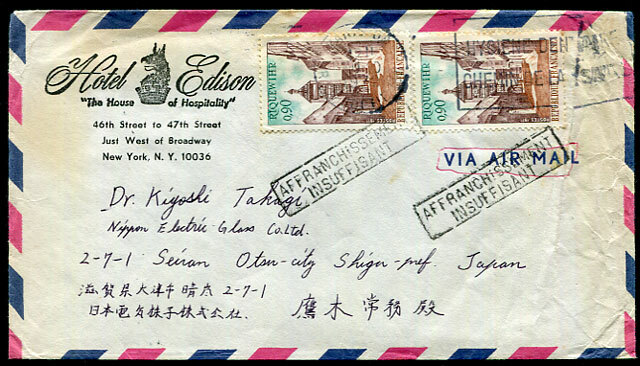 1967 (DE 21) underpaid cover to Hamilton with U.S. 5c Washington pmk'd New York, taxed with POSTAGE/11d/DUE added on arrival. 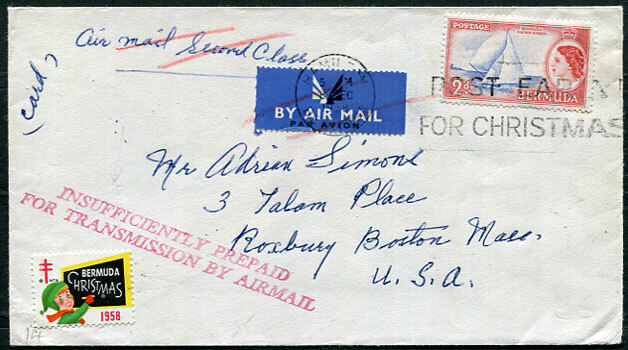 1958 (DE 8) cover with QE2 2d for Second Class Air Mail (deleted) pmk'd Hamilton to Boston, Massachusetts, red 2-line "INSUFFICIENTLY PREPAID/FOR TRANSMISSION BY AIRMAIL". 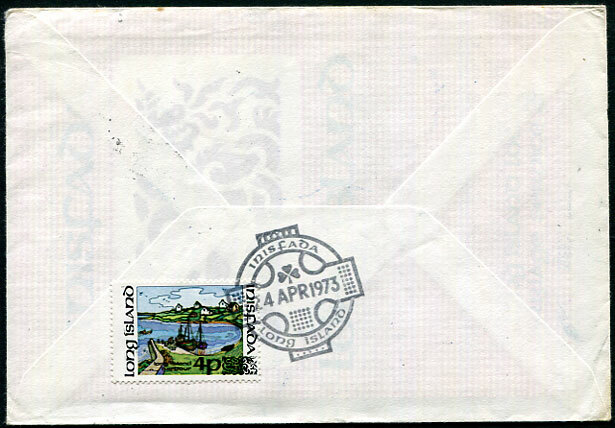 1979 (JU 25) stampless cover pmk'd Gwent attracting boxed red "Fine/Return To Sender", purple boxed "INSUFFICIENTLY/PREPAID FOR/AIR MAIL", tax and Bermuda Postage Due handstamps, no backstamps. 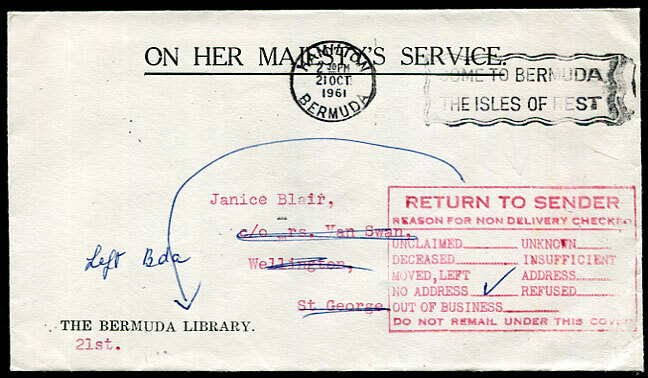 1961 (OC 21) stampless OHMS Library cover pmk'd Hamilton to Wellington, St. George with red boxed RETURN TO SENDER marked "unknown" with manuscript "Left Bda".